Dual Density Vibram soles give great traction and are repairable at walking-boot specialist repairers. 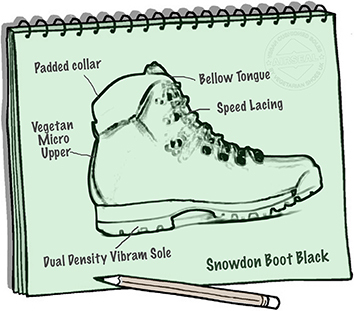 Medium stiff insoles are not stiff enough for crampons but are good for day-long trekking. Rubber side rand makes the boots even more knock-proof. The toughest, hardest wearing and most water resistant breathable material that we use. Like all our materials it takes little 'breaking-in', is exceptionally like high quality leather in performance and has a distinctive grain. Use ourblack or dubbin to improve water resistance and cover up any scuffs. Do not use solvent based shoe-care as this can affect the surface of material. Lined throughout. With padded ankle and collar. Also padded 'bellows' tongue and padded insole. With speed lacing and ski-hook combination.